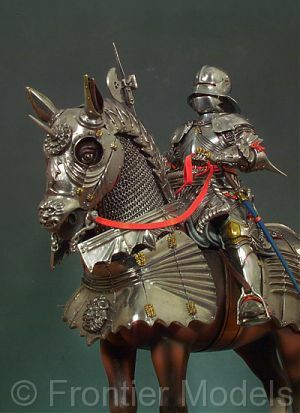 I am drawing a picture of a mounted knight, and am trying to make it as historically accurate as I can, and I want to know, how would a mounted knight, being in full plate, carry his sword? would it be somewhere on the horse's harness? or maybe on his belt? if it is on his horse's harness, then which side? I have heard of some cavalry units in the civil war carrying their swords on the dominant side, to spare the horse an accidental cut. I really don't know how to draw it. btw, the knight is riding visor up, slumped down having just recieved his lady's colors from her, and is walking his horse away, as he holds them. Whatever happened to his lance? V ery pretty model. But its strange that he is carrying a poleaxe (for foot combat), instead of a lance. The sword scabbard could also be strapped to the saddle. When I look for an image of a knight, I look pre 1400 . The crusades offer some pretty ideal images. Mail armor for most of them, lance in hand, sword at the belt, shield in off-hand. Perhaps a Coat of plates and a great helm for the rich ones. The 15 th century images in full plate are past their time. Yes, they did exist in the 15th century in full plate, but for such a short time and because they were on the way out I do not consider the 15th century "their era". The 15th century belongs to the pikemen and halbardmen working for wages. I'm planning on adding it, but so far as I know most knights had a sword, just in case he was "unhorsed" in battle, (assuming he got away before the men at arms could start hacking away at him) or if he somehow lost his lance. I don't imagine it would be an effective weapon, if he got hemmed in, and was hard pressed on all sides. while I agree, there is nothing quite so impressive, to me at least, as a mounted knight in full harness. Previous comments about the scabbard mounted to tack and appropriate arms seem to be on target. I can't tell anything about the sword suspension at all though. 14th century, I would expect something a little closer to transitional harness, but well into plate era. I think all you need to do is get the harness right for the period. Armament should be pretty much the same. Sirs- Most knights carried a riding sword,( short sword 24-26 in ) on their belts and a war sword on the saddle.The "Vie de St Louis" by the Seur de Villehardouin (availsble in english trans) illustrates rhis point perfectly. The Seur was ambushed by rwo moslem knights, one pinned him to his saddle with a spear in the back the other rode to cut hin down from the front. He drew his riding sword from his belt,as he couldn't get to his war sword, and killed the second man's horse. then he drew his war sword and killed them both. Oakshott illustrated and described many of these riding swords as many types, from type XI to type XVIII were made as short swords and carried for use in the melee like Villehardouin did,or for fighting on foot (scaling walls,etc) So most should show a short sword on the belt, and a long sword on the saddle. Many momunenrs illustrated by Mr Oakshott do in facr show short swords. that is very illuminating. I have often wondered about that very thing. thanks for illustrating. Sirs- Most knights carried a riding sword,( short sword 24-26 in ) on their belts and a war sword on the saddle. Anyhow, in the context originally posed, "having just accepted his lady's colors", I assumed that the idea was a knight in tournament. By late 14th century, there are several accounts (such as Jean Froissart, died early 15th century) of feats at arms that describe contests to have frequently been organized in sequential stages featuring the same type of weapons being used by combatants. (Usually three separate types of engagements; lance, axe/ sword, etc. in a sequence of matches.) I am not sure how the riding sword concept would fit into such a situation. Mr Smith- the riding sword, as Mr Oakshott describes it in "Records of the Medieval Sword" and other publications, seems to have been a weapon for war, as Villharduin describes it, or for situations where suprise close combat was expected. It seems not to have been carried in tourneys etc, but the numbers found,and the fact that they lasted so long, as I said, every type from XI to XVIII had a riding sword version,attests to their popularity and versitility in combat. In looking at Oakeshott's The Sword in the Age of Chivalry where he mentions the Joinville incident, he doesn't speak of riding swords or different sword sizes at all. The quote simply speaks about the man being unable to draw the sword with which he was girded, so he drew the one on his horse. Later on that page (page 45) Oakeshott notes D'Orronville described David Olegreve who carried two swords, one girded and the other on the frame of the saddle. On page 44, Oakeshott uses the term "arming sword" as one of the two types of swords (great sword being the other) that a knight would carry. A riding sword is generally a shorter, lighter sword better suited for unarmoured combat. An arming sword is a single-handed battlefield sword, usually larger than what we think of as riding swords. To me, that's an important difference in terminology. We have these two accounts of people being armed with a sword at their waist and one on their saddle, but neither specifies that one sword was shorter than the other (which Oakeshott notes). We also have plenty of period art that doesn't show knights with 2 swords. Because of that, I can't say for sure how common it was to wear two swords and/or whether one was usually longer than the other. I suspect that wealth and status could have made a difference. Some could have had uncommonly high quality personal weapons (resupply from esquires, etc. ), while others would rely upon munitions grade supply. Oakshott's Records of the Medieval Sword has an introductory section "Supply" (page 9 in the 1991 printing) discussing the fact that he initially believed that medieval combatants had several types of swords to chose from for different situations. However, he stated that he had later changed his mind such that he believed swords were generally issued singularly from supplies to most individuals. I have not been able to relocate the account, but I had once read that the Black Prince would dismount and go into late stages of battle on foot. It was at the point when he dismounted that his body guards would hand him his "very long sword with uncommonly long hilt." He could have carried a sword more manageable in one hand when mounted, even if nothing was said about his mounted equipment. I have always understood the riding sword as a civilian weapon of self defence and not a sword of war or at least not one which was used when combat was expected. Literally a sword one wears while riding or travelling; when the wearing of an arming sword would seem to be inappropriate (projecting an overly aggressive posture) and/or anything larger than an arming sword might well be an encumbrance. Its effectively a compromise weapon between offering an effective sword, but also one which is portable and inconspicous. I don't really see the logic in carrying a small riding sword in war when one might as well carry a longer arming sword. Of all of the situations I can think of in warfare, either an armong sword or a war sword would be better employed rather than a riding sword. The only exception I can think of is when on the march, travelling through relatively safe territory. Thats not to say that Riding Swords never found their way into military situations, I just don't think it was very common. 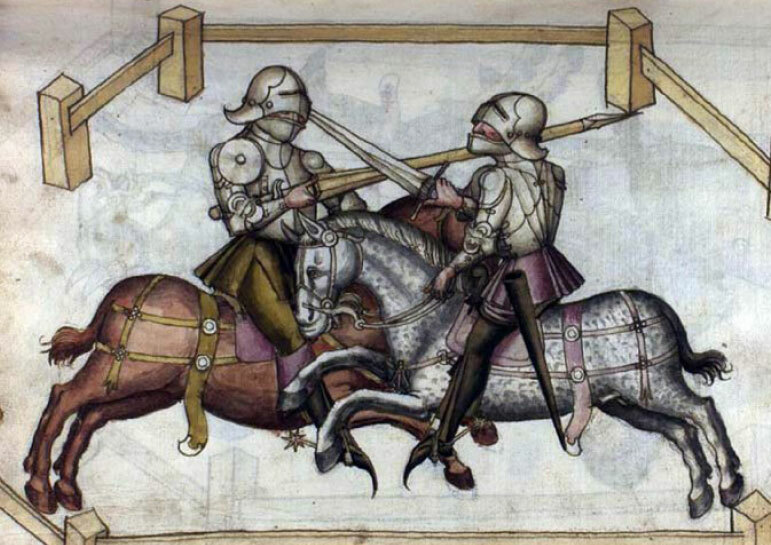 Also there are many period illustrations which show fully armoured knights carrying war swords suspeded from the belt and not attached to the saddle. This would suggest that the longer war sword was easily worn like this in battle and was vesitile enough to be used in most if not all batlefield situations if need be. Oakeshott himself begins to dismiss the notion that knights neccesarily carried different swords for diferent situations (ie a shorter sword for melee, a longer sword for mounted combat etc) and I'm inclinded to agree with him. I think the cases of knights carrying more than one sword are simply examples of knights, if they can, carrying extra weapons into battle; reguardless of the particular type of the additional sword. Having a spare sword at hand would seem advantageous as Sieur de Joinville can well attest. If you'll notice, I've discussed the use of the term riding sword, which Oakeshott didn't use in this context. He used the term "arming sword".